You may not have come across Linda and Neal Rogers' books before, but if you haven't, you are in for a treat. Their previous work, Saltwater Fly-fishing Magic is one of my favourites - OK, so it isn't quite in the class of Casting Illusions, but then what is? This is a gigantic book in every sense of the word - folio size, it makes a real handful. Lush is the only way to describe it. In this, the Rogers' latest work, you have 136 large-format pages of the sort of stunning colour shots you can only get if you live your life in the wild, warm south. If you like the idea of bonefish in the Yucatan, or gators and tarpon in the 'Glades, Memories is well worth a punt. The photos are woven around a homely text written by Flip Pallot that isn't a serious attempt to do anything other than shoot the breeze, but you aren't buying this mother to read it. If you can stand the layout, this is a book to prop yourself up next to on a cold winter's night, listen to the wind howling, take another sip of whisky, and dream on. 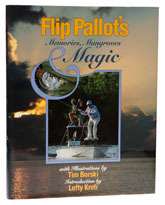 Apparently out of print, but well worth getting if you are into saltwater.